If you are relatively new to eCall or eCall testing, I would suggest you to try this test case not only for testing itself but also for understanding basic eCall process. This would be the simplest test case but show you the full protocol sequence for an eCall session. Overall test seup that I used for this example is illustrated below. I used Anritsu Cellular Network Simulator MD8475 and PSAP simulator MX703330E. 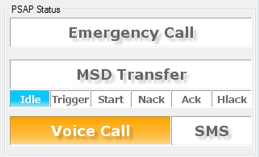 As a DUT, you may use any eCall Module. It can be your own device or (if you don't have any DUT) you may purchase it from several manufacturer in the market such as Ublox or Telit. 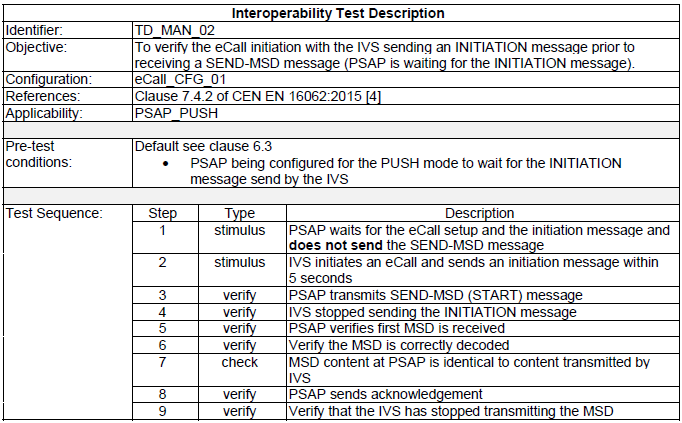 The test sequence for this example defined in ETSI 104.428 : 7.1.2 MSD transmission / reception / acknowledgement with PSAP in Push mode is as follows. Following is the overall protocol sequence from the Anritsu system. I would suggest you to go through the protocol details shown here and associate the sequence from the test system with the test sequence defined in the specification. If you owns this system, I would suggest you to try this sequence several times on your own until you get familiar with details of the operation and protocol sequence. Once you get familiar with this, it will be much easier to understand more complicated test sequence and understand the eCall protocol as well. Now let's get into the details of each step. Step 0 : This is not specified in the test specification, but it is a kind of precodition for the test. Before starting any eCall protocol testing, you have to make it sure to establish a voice call over a cellular network (GSM or WCDMA). In case of Anritsu MX703330E, the voice call setup is indicated as shown below. Step 1 ~ 9 : Following is the protocol sequence showing the steps defined in the test specification. To help you with understanding the sequence, I highlighted the blocks of the sequence and labeled the numbers that corresponds to each steps in the test specification. If you are not familiar with eCall protocol sequence itself, I would suggest you to compare this sequence with the PUSH Mode Protocol Sequence diagram shown here. NOTE 1 : It would be a little bit difficult to confirm Step (4) directly. I think the surest ways is to use oscilloscope and directly measure the eCall signal from the device. However, it would be too cumbersome to do this for every test. Another (rather simpler) way is to check DUT log (IVS log) if available. However, you may not have access to DUT log. The most convenient ways is to check the protocol log on test system to see if you see 'INITIATION' message at step 4 or not. If you still see 'INITIATION' at step 4, it means Test Fail. NOTE 2 : For step (7), Anritsu MX703330E provide MSD Decoder window as shown below. 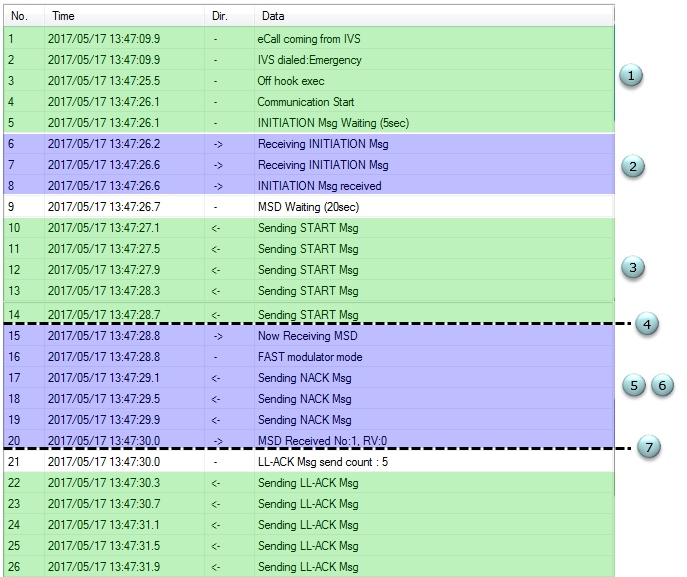 It shows both HEX string and decoded version of MSD message it recieved. You can compare this with the MSD you sent from DUT(IVS). NOTE 3 : It would be a little bit tricky to directly verify Step (9) without using oscilloscope. One simple method would be to check if Audio signal(e.g, say 'Hello' to the microphone of the DUT) go through and you can hear the Audio Loopback through the headset of the DUT. If you can hear the Audio loopback, you can assume that HL-ACK successfully received by the DUT and DUT completes eCall process and UnMute the IVS.